Page revised in November 2018. The photos were taken in April 2010. Soon after quitting the town (Hama), the traces of cultivation began to languish, and we saw nothing but fine pasture land, covered with numerous flocks of goats and sheep, and camels, belonging to the Bedouin Arabs, who had small encampments in the neighbourhood. From Hama, the Orontes takes a westerly direction; then to the northward, and in less than three hours we again joined the river; (..) we entered on a fine plain, which only required the plough to render it very productive; (..) we proceeded across a large plain, whose exuberance in wild herbs and flowers sufficiently announced the fertility of the soil. Travels through part of the ancient Coele Syria and Syria Salutaris - from the papers of Lieutenant Colonel Squire - Edited by the Rev. Robert Walpole - London 1820. At the beginning of the XIXth century the plain of the River Orontes looked abandoned and unpopulated to western travellers, but in ancient times it was a very fertile land which supported the development of Apamea, a large city. 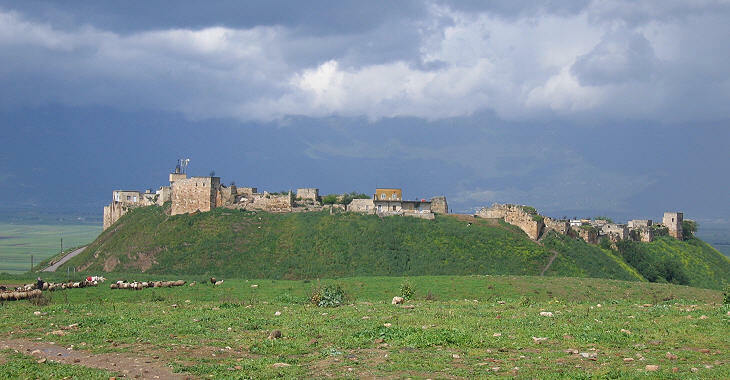 We arrived at the foot of the hill upon which stands Kalaat el Medyk or the castle of Medyk. It probably occupies the site of Apamea. (..) Notwithstanding our desire to enter the castle, we could not venture to do so; (..) we therefore passed by the foot of the hill, while we sent in our attendants to buy some provisions. The castle is built upon an almost insulated hill and (..) it is built of small stones, with several turrets, and is evidently of modern construction. (..) I was told that the only relic of antiquity is a wall in the governor's palace, built with large blocks of stone. At the western foot of the hill is a warm sulphureous spring, the water from which forms a pond; on the edge of the pond I found a fragment of a fine fluted Doric column. (..) On the N. side of the hill are several columns scattered about. John Lewis Burckhardt - Journal of a Tour from Aleppo to Damascus in February and March, 1812. The acropolis of Apamea was located in a commanding position in the valley of the Orontes; there is evidence that the site was populated from Hittite times, but it became an important settlement only after Seleucus, a general of Alexander the Great, founded an empire which included Syria and most of Anatolia. Seleucus gave the town the name of his wife Apama. 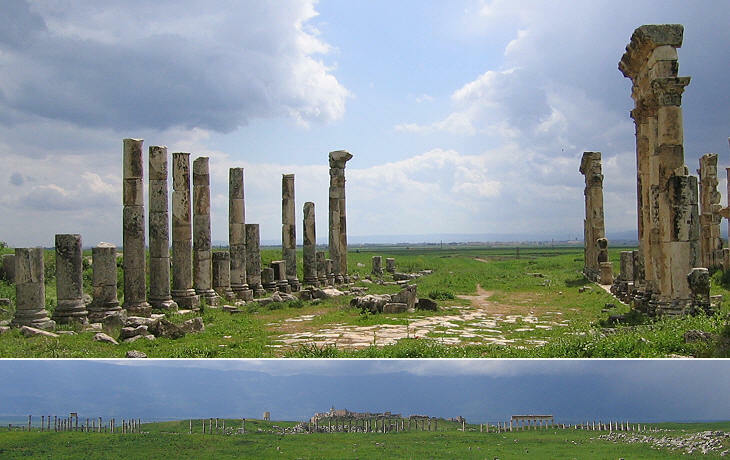 Apamea expanded in the plain to the east of the acropolis and became one of the four great cities of the Syrian Tetrapolis with Antioch, Seleucia Pieria and Laodicea (today's Latakya). 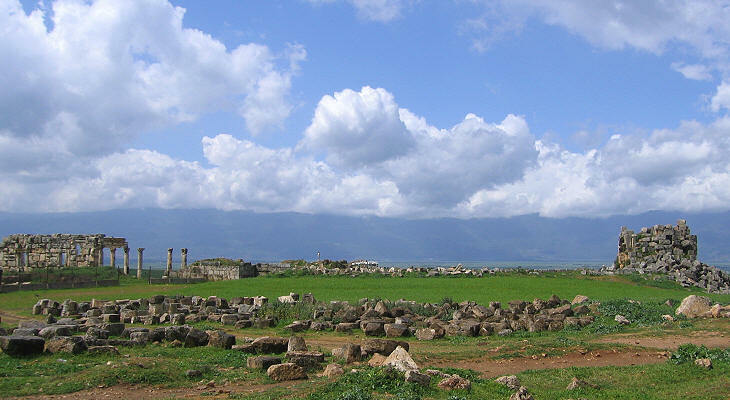 Apamea was an important military base for the Seleucid kings as it protected the way to Antioch, the capital of their empire. 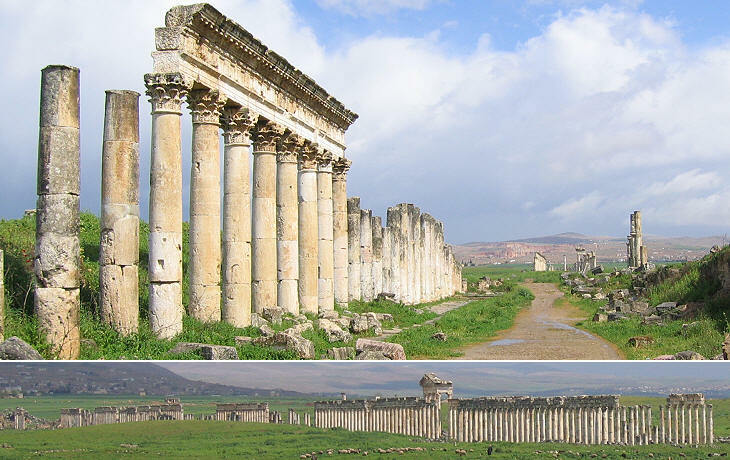 The citadel of Apamea was destroyed in 64 BC by Pompey, but the Romans promoted the development of the city in the frame of their overall policy aimed at expanding farming and increasing stable settlements as a mean to control the territory. 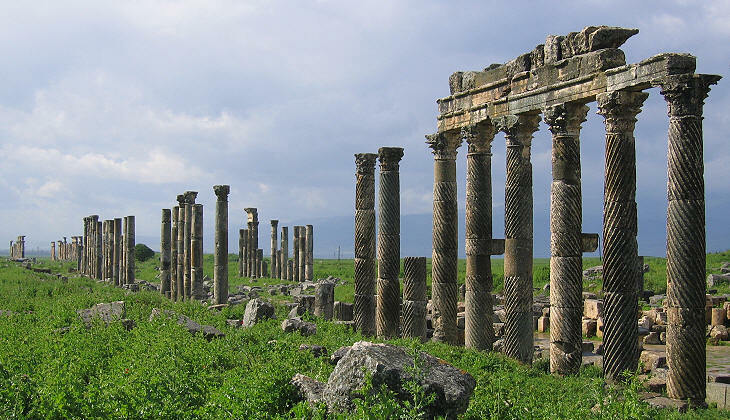 It is thought that Apamea and its surrounding district reached 500,000 inhabitants at the beginning of the Ist century AD. 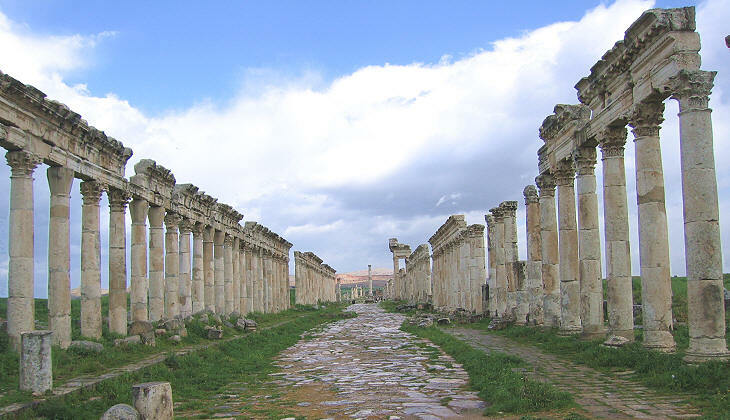 On December 13, 115 AD a disastrous earthquake struck Apamea; at that time Emperor Trajan and his successor Hadrian were in the region and Apamea was soon rebuilt. Many honorary inscriptions celebrate Lucius Julius Agrippa, a wealthy citizen of Apamea who acted as ambassador of his city to the Roman Senate and to the emperor; notwithstanding his Roman name, he belonged to a very important local family. The age of Trajan and Hadrian was marked by an extraordinary construction activity which included the first stone bridge on the Lower Danube and Hadrian's Wall in northern England in addition to aqueducts, temples, baths, arches, markets and roads throughout the empire. Apamea was rebuilt in line with this tendency to express the strength and wealth of the empire through gigantic public facilities. The plan of Apamea before the earthquake was already based on a grid, but this layout was emphasized in the reconstructed city by an impressive Cardo Maximus, its main north-south oriented street. The importance given to the north-south axis was due to the fact that the key road from Antioch to southern Syria crossed Apamea in that direction. Cardo Maximus had a length of over a mile and it was flanked by two uninterrupted porticoes; their construction started from the northern gate and it was completed in about 50 years. A higher column or a tympanum indicated the presence of temples, baths or markets at the side of the street. 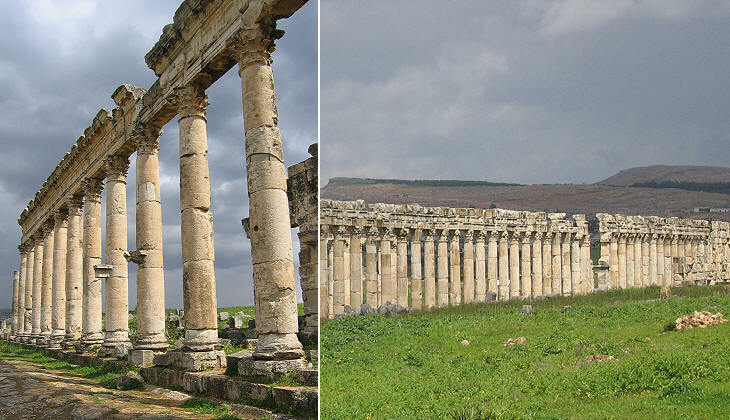 The wealth of Apamea resided in part in the prestige of an oracle housed in a temple to Zeus Belos (a deity having features of Jupiter and Ba'al - see its shrine at Baetocece). It is known that Emperor Septimius Severus used to consult the oracle prior to campaigning against the Parthians. 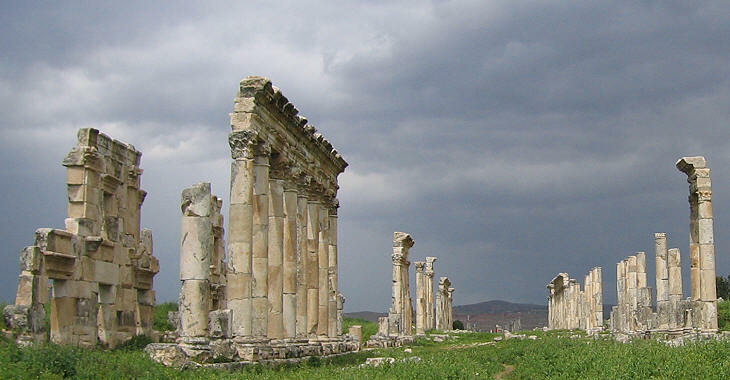 At the request of the Bishop of Apamea the Temple to Zeus was destroyed by the troops of Emperor Theodosius in 384-85. 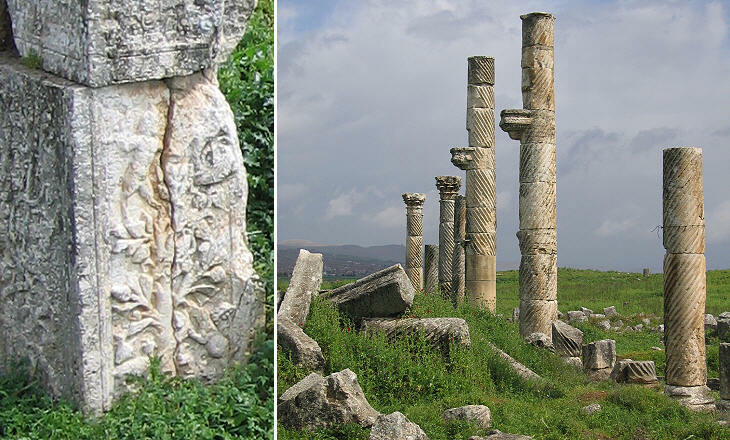 The site of Apamea was identified as that of an ancient city in the middle of the XIXth century, but the first archaeological excavations started in 1925; they have focused on Cardus Maximus where some 400 columns have been re-erected, whereas other parts of the city are still to be explored.